Home > Android Tips and Tricks > How to Turn On Android Phone Without Power Button? Many a times, we face some software issues with our Android devices. These are usually caused when programs, or the operating system itself, get corrupted due to an unexpected app crash or rogue app performance. This can lead to performance issue or bugs which lead to unwanted behaviour of the smartphone. Such rogue applications can cause bad cache files to be created on your device which may not only occupy space but affect regular usage as well. In such situations, restarting/rebooting the Android device or smartphone helps clear out the corrupted code and the device starts afresh. To do this, one just needs to press the power button for 2-3 seconds and then select power off from the popup menu. We can also continue to press the power button till the device restarts. However, being a mechanical button, the power button can become unresponsive or can completely die out after some time. This can be a real problem as now we cannot power on or power off a device. A power button is an important button on out Android smartphones. If you are stuck in a similar situation, then worry not. In this post we will tell you how you can reboot or restart your Android smartphone without using the power button. You can also go through this guide to keep yourself aware, if ever you are faced with such a need. If your power button is not working and you need to restart your device, try this trick. Trying pressing both the volume buttons at once for a few seconds. This will show a boot menu on the screen. From this menu, select Restart to reboot your device. If your device has a home button, you can also try to press the volume and the Home button simultaneously. If nothing works, let your smartphone battery drain so that the phone shut down itself. Then charge it and it will restart. If your smartphone is in sleep mode (screen off) and power button is not working, then you can try the following tips. Some smartphone these days have double tap to wake feature. You can use this functionality. If your smartphone does not have this functionality, and volume buttons don’t help either, just plug the phone into a charger and the screen will light up. If that also is not possible, ask a friend to give you a call. Once your phone is awake, you can try the first steps using volume buttons to turn on your Android device without power button. There are also certain apps to restart Android phone so as to help you solve the issues of power button not working. In the following part of the article, we are going to suggest you two of the most used Android restart applications. As the name itself suggests, this app allows you to use your volume button for waking up your Android smartphone if its power button is broken, or not working properly. It is a free app on the play store and is also totally ad free. When you have installed the app, you need to give it administrator privileges so that it can perform the tasks of power button using the volume button. 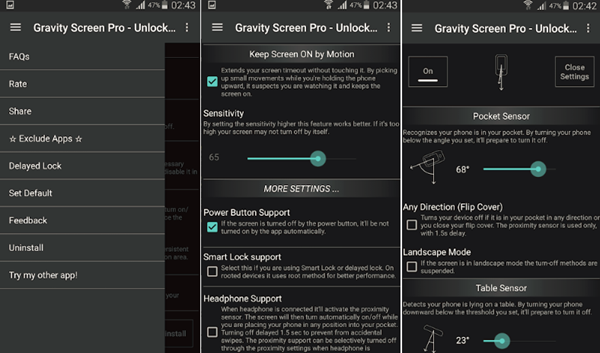 Another app that is useful when power button is not working is Gravity Screen, which also requires administrator privileges. It can automatically turn off the screen when you put your Android into your bag, pocket and even onto a table, and it will light up the screen when you pick out/up the phone. You don’t need to touch any button and you are ready to go. Apart from these, there are certain app that allow you to not only turn screen on and off, but also restart your device using a software option. However, since such an action requires deep system level privileges, your device must be rooted to use these apps. Only then can you achieve complete functionality. See How to Root and Unroot Android Phone and Tablet. However, it is strongly suggested to buy a new Android phone. A power button is a very important button and with most smartphones these days coming with full screen displays and no other buttons, importance of power button increases manifold.